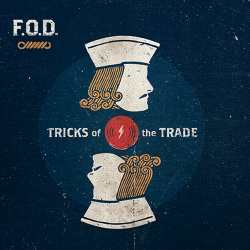 I thought that everything that could be done in the melodic punk rock genre had been done already ages ago, and then came along Belgian quartet F.O.D. to prove me royally wrong. One year after their debut longplayer Ontario, they are back with their sophomore record Tricks Of The Trade where they once again show that it is not impossible to write seventeen super-catchy songs in just one year. First things first though. I have to concede that F.O.D. don’t reinvent the punk genre, and there are shadows of Bad Religion and Green Day, and certainly of many other pop punk bands. But that which distinguishes F.O.D. from the competition are the incredible vocal harmonies. Ok, so Bad Religion did that first, and before them even the Buzzcocks, but F.O.D. take it to the very top. Two vocalists come up with such intricate vocal harmonies that one can’t help thinking they must have had professional help, like intensive vocal coaching since their early childhood. That by itself would of course not be enough to turn Tricks Of The Trade into the masterpiece that it has become. Many songs among the seventeen present are instant smash hits with memorable choruses. The lyrics may be a little saccharine at times, but somehow fit the melancholic mood of the music. Highlights include the opener Random Thoughts On A Saturday with its mind blowing chorus beginning, the heart warming My Daily Valentine, the ultra short Sing Along which is vocally so complex that singing along is definitely only an option for the very skilled. Tricks Of The Trade is pushing melodic pop punk rock to a new level, and it might be a little too adventurous for the more conservatively minded punk rock fan. Anybody else will hear that this is an instant winner that will grab your attention from the very start and not let loose ever after.